Ashley Tisdale (High School Musical, TV’s “Phineas and Ferb”) makes magic in her Daytime Emmy®-nominated role as television’s favorite teenage witch in the hugely entertaining movie adventure Sabrina – Secrets of a Teenage Witch: A Witch and the Werewolf – The Movie, arriving on DVD (plus Digital) and Digital HD September 9th from Lionsgate Home Entertainment. Based on the hit Archie comic book series, Sabrina – Secrets of a Teenage Witch: A Witch and the Werewolf – The Movie follows the charming Sabrina Spellman (Tisdale) who leads a double life as both a klutzy high schooler and superhero sorceress. The movie is a co-production of Splash Entertainment, Archie Comics Productions, DSK Entertainment LLC, Laughing Lion and Telegael. Garnering 2014 Daytime Emmy® nominations for “Outstanding Performer in an Animated Program” (Ashley Tisdale) and “Outstanding Achievement in Main Title and Graphic Design,” “Sabrina: Secrets of a Teenage Witch” currently airs Saturday mornings on The Hub. 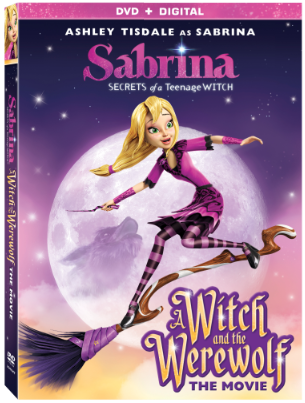 The Sabrina – Secrets of a Teenage Witch: A Witch and the Werewolf – The Movie DVD includes the “Cast My Spell on You” music video and will be available for the suggested retail price of $14.98. Title Copyright: © 2014 Splash Entertainment, LLC, Telegael Teo. All Rights Reserved. Package Design and Summary: © 2014 Lions Gate Entertainment Inc. All Rights Reserved.